Nearly 200 people joined us on a winter Sunday afternoon for explorations into the horse/human connection at our Winter Film Festival on January 28. Two extraordinary films, Herd, and Talking to the Air, provided our launch for 2018 with their inspiring and informative story lines. Herd, We Are All Here to Heal Together won two first place awards for Best Director and tied for Best Documentary at Equus International Film Festival. It was chosen for our screening partly because it demonstrates in a more stunning setting the same kind of things that go on at Riding Beyond. 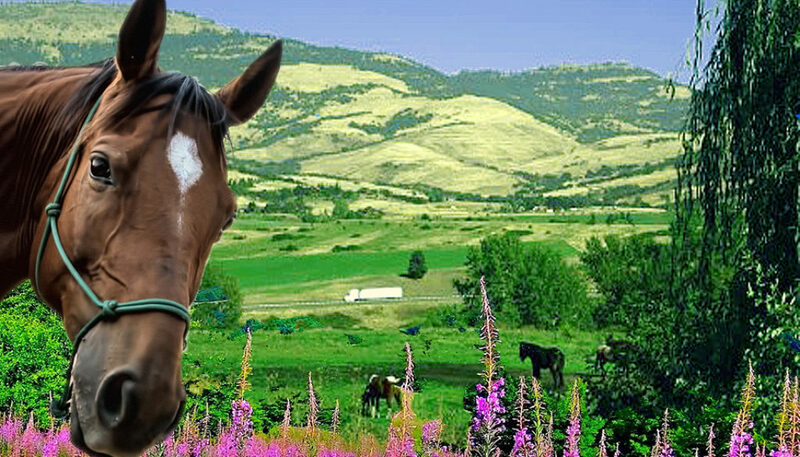 Herd chronicles retreats at a 320 acre sacred land of old growth forests, where meadows, lakes and hills, the vistas, colors, textures, flora and fauna, all reflect the miraculous diversity and creative expression of the one consciousness in all life. The animals there live and teach truths that are just being discovered by human science: The field, wave theory, entrainment, telepathy, clairvoyance, spontaneous healing, where all are the obvious expression of true connection to that flow of one consciousness. Talking to the Air, The Horses of the Last Forbidden Kingdom, took us to a tenuous border with China, where the vanishing medieval culture of Mustang measures a man’s wealth in horses and riding is as elemental as breathing. 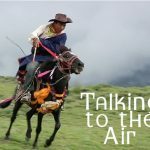 This in-depth look into a another world won Best of Film and tied for Best Documentary at the Equus International Film Festival. It was chosen for its global reach, the terrain of Riding Beyond this year and into the future. Starting with our first year of programs in 2013, we have launched each year by anchoring our work in a larger context. Some of you attended that first one in August 2013, followed by my sundancing the next year in South Dakota at a Wild Horse Sanctuary, and something unique every year since then, including planting a beautiful, flowering Dogwood tree last year at Little Creek Ranch. The power of those launches has helped in an important way: a couple of years ago, we began offering training in Riding Beyond to horse professionals all over the world wanting to respond to this epidemic of breast cancer in first world countries affecting women in their own communities. Several hundred have been trained now and in March a three part webinar training went out to the 8,000 members of PATH International, the professional association for the therapeutic riding industry. Plans are coalescing for this training going to Europe this summer. October as Breast Cancer Awareness month will be celebrated once again with our Salon on October 28, this year featuring Peggy Rubin in performance of Rupert’s Birthday and Hollis Peach in concert with their original music and song. Other events are in planning stages for the month and will be announced soon, including something special for First Friday Art Walk. Additionally, this year we have an opportunity to begin rigorous research on Riding Beyond, an exciting endeavor to unfold in this and coming years. Riding Beyond begins its first sessions of the year tomorrow as warmer climes open us to the possibilities of springtime and the possibilities in our own lives, accompanied by the power of the horse. We have public events several times this year, as well as the individual sessions. I hope you will join us. Get details here.